Some 80 per cent of patients who have undergone the procedure say they would readily have it again. While 70 per cent believe it is more effective than conventional medication. When asked about their experience of electric shock treatment, also known as electroconvulsive therapy (ECT), patient comments included ‘overall it was pleasant’, while a carer said ‘it was the best thing that my wife could have had’. ECT is mainly used in patients with severe, life-threatening depression who have not responded to medication or therapy. 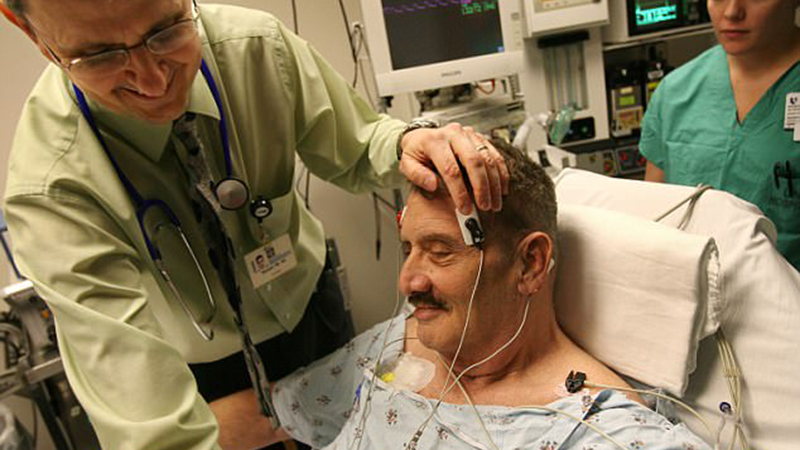 Electroconvulsive therapy (ECT) is given under a general anaesthetic and involves using muscle relaxants. It causes the muscles to twitch slightly and not convulse. It may involve changing blood flow patterns in the brain. Some users find it hugely beneficial, while others report feeling violated. Researchers from the Tamil Nadu Medical Council in India analysed 30 patients with an average age of 62 who received ECT at Worcestershire Health and Care NHS Trust between January 2013 and December 2014. Some 93 per cent of the participants were women, which is thought to reflect depression being more prevalent in females. The patients or their carers completed questionnaires and were interviewed by the researchers to determine their experience of ECT. Electroconvulsive therapy (ECT) is on the rise in England to treat serious mental health conditions. The controversial treatment was thought to have fallen out of favour, yet figures obtained via freedom of information acts back in April demonstrate its popularity. The treatment involves sending an electric current through the brain to trigger an epileptic seizure that helps to relieve certain mental health symptoms. ECT’s rise may be down to improved patient access, a lack of alternative treatments or simply the seemingly crude procedure’s effectiveness at easing severe mental health problems. More than 22,600 ECT treatments were carried out in 2015-16 across four-fifths of the NHS’ mental health trusts – a rise of 11 per cent since four years earlier. Results revealed 80 per cent of patients would readily have ECT again if necessary as they believe it is a useful treatment option. Some 70 per cent of participants believe it improves symptoms quicker than drugs. When asked about their experience, patient comments included ‘positive’, ‘scary imagination reduced by staff’, ‘staff were really professional and friendly and explain things at your own pace’ and ‘overall pleasant’. Carer comments included ‘wish it had been started sooner’, ‘it was the best thing that my wife could have had at that time’ and ‘ECT was incredible, we were quite worried at first but the team assurances proved to correct’. The results were published in the journal Progress in Neurology and Psychiatry. Dr Guruvaiah said: ‘ECT is a very effective but underused treatment partly due to the perception of the nature of this treatment. ‘This study illustrates that the overall experience and attitude of patients and carers on ECT treatment were positive.